As time went on, we found a rhythm in our daily life. Jerry and I re-committed ourselves to our marriage and found a better balance of parenting, working and Jerry’s schooling. Jonathan started preschool and Courtney found a little peace from her seizures while on the Ketogenic Diet. Life was as normal as it could be for us. Jerry and I worked hard to keep the communication lines open and when things got difficult with Courtney’s health we banded together to support each other instead of fighting against one another. Healing hearts doesn’t happen over night but it is possible. I had learned that all suffering has value. If I married my suffering and hurting heart to Christ’s than that suffering is lifted up honoring and glorifying God. With God all things are made new. It would take years but eventually our marriage would be completely healed. I was still overwhelmed from time to time with everything that needed to be taken care of with Courtney’s daily care. So many doctors appointments, so many meds, so many therapies to attend to. 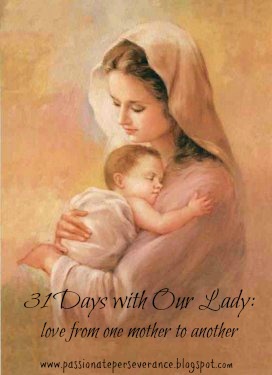 I continually sought Our Lady’s help and guidance, no matter how small the issue. It was a comfort to me to have my spiritual mother close at hand. The thing is when I get comfortable, I tend to let my spiritual life get stale pretty quickly. It’s something I have fought my whole life and continue to fight to this day. Comfort equal lazy Mary. When God needs to move us forward, he has a tendency to make life uncomfortable for us. It’s his way of getting our attention I think. Needless to say it always works. Jerry and I were still adjusting to the fact that our daughter’s life would not be what we thought it would be when she was born. When a parent is told that they would be caring for their child for now and always, it takes a while for all of it to sink in. We had seen miracles and knew that God would be with us, but he’s not one to show up and feed and medicate your kid at 3am. That, I had to do. The more uncomfortable I was with Courtney’s care the more I relied on Our Lord and his mother to be with me. The line of prayers rapid fired between heaven and earth some days and others there was peace and quiet. I was learning yet another lesson about trust. The more I said “yes” the more uncomfortable I became. The more I trusted the more God asked of me. It was stretching me and it hurt. It’s hard to trust you Son when it hurts so much. I know you want us close by, always leaning into whatever Jesus is asking of us. He has our best interests in mind and we need to let go of our fear and our pain, so that we can cling to you both. Help us Mother Mary. Help us to remain clam in the midst of the storm in our hearts. Stay by our side Mama, and protect us as you did your Son, until he needed to do what God had sent him here to do. We love you sweet mother and we trust you to hold our heart. We ask this in the name of you son Jesus.